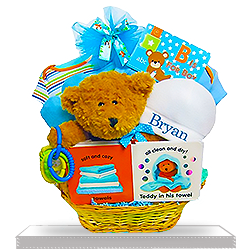 A huggable teddy bear leads the way in this adorable giftbasket for a baby boy. 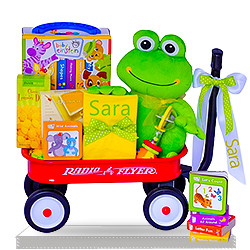 Also included are useful teether rings and a Bathtime board book. 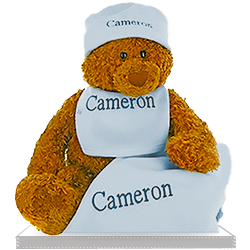 Tucked inside you'll find a cotton bodysuit, a cotton onesie, scratch mittens, and a personalizable fleece baby hat. 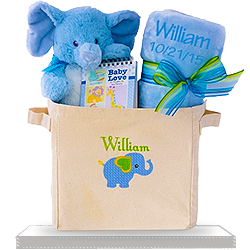 This thoughtful gift is delivered in an attractive wicker basket. Great service and great product as usual. 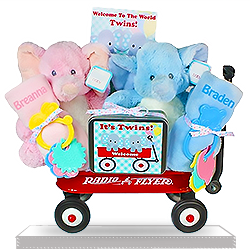 Perfect gift for those who have baby boy. 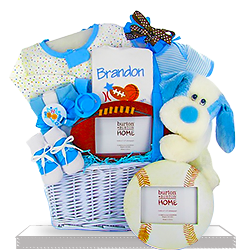 I will definitely be using giftbaskets4baby for my gift basket needs in the future! Successful, & appreciated. Ordered for a friend for her baby , she loved it! Was a good size and nice presentation. Delivered on the expected day. I was nervous having never used y'all, but you performed! Excellent gift and quick delivery. Thanks for your prompt easy service. new mom was very happy with this gift. 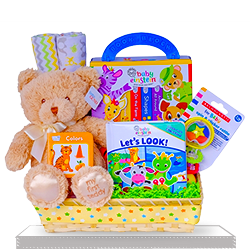 she loves everything and was surprised at all goodies in the basket. My friend called to thank me for this gift. What a creative idea, we both got a good laugh. Thanks! 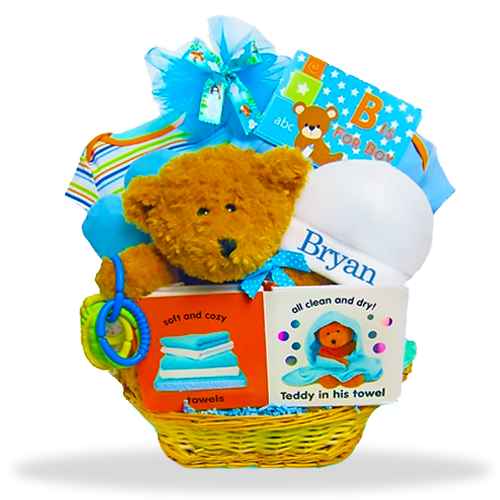 It was delivered in a timely manner and my customer has been raving on this Bear's Welcome basket and how good it was. Customer service was very helpful. Thank you! Packages always arrive on time and beautifully packaged. 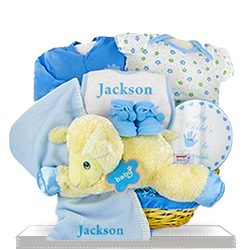 This gift is an excellent value at a great price. Presentation was wonderful. Parents loved it. Sent this to a friend and don’t really know whether she liked it.